Rundholz Dip Collection over-dyed, stretch fabric, lowish-crotch, straight-legged trousers in smoked grey colour. Belt loops and buttoned fly with buttons showing. 2 rounded side pockets. 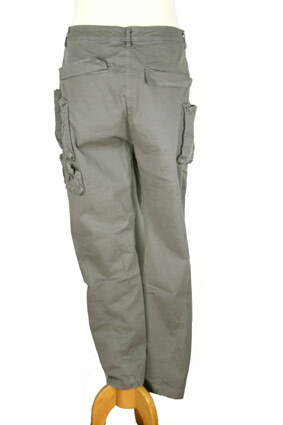 On left thigh there are 4 pockets of varying sizes extaending out from the garment and on the right thigh there are 4 similar pockets of varying sizes. 2 flapped pocket at the rear and 2 extending pocket of differing size on the left. These are real special trousers, cleverly designed.